National Carriers is pleased to announced Liberal, Kansas resident, Phil Nix is the National Carriers Driver of the Year. 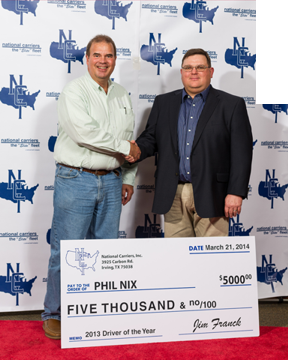 Selected from twelve finalists, Nix was awarded $5000 by National Carrier’s President, Jim Franck. In a surprise visit, Liberal, Kansas mayor, Dave Harrison, delivered Nix’s bonus check to the stage for the presentation. The award was presented at the National Carriers annual Driver of the Year Banquet held at the Bob Duncan Center in Arlington, TX. The banquet featured an Oscar’s theme complete with red carpet, paparazzi, and Oscar trophies with a catered meal following the banquet. Nix was selected from a pool of over 750 eligible drivers for the award. 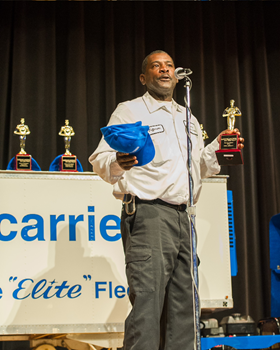 He began his career with the “Elite” fleet® in June of 1990. He owns and operates truck # 555 and works within the National Carriers livestock division. National Carriers is a diversified motor carrier servicing all 48 states in the continental United States with transportation offerings which include refrigerated, livestock, and logistics services. At National Carriers, our mission is “to be the safest, most customer-focused, and successful motor carrier in our class.” Our team consists of only the “Elite” fleet® driving and office professionals. To stay updated on National Carriers, via our social media community: www.facebook.com/nationalcarriersinc, Pinterest.com/nationalcarrier, YouTube.com/nationalcarriers, Instagram.com/nationalcarriers or follow us on Twitter.com @NationalCl. Industry news, National Carriers business updates and recruiting information is featured at www.nationalcarriers.com or www.drivenci.com. Security Officer, Willie Jefferson was chosen as the Barney Award winner at the annual Driver of the Year Banquet held March 21, 2014 at the Bob Duncan Center in Arlington, Texas. The Barney Award is National Carriers equivalent to MLB Most Valuable Player Award. The Barney Award goes to the office or shop employee who most exhibits his/her love of their job at NCI. Employees nominate potential candidates and from those nominees the winner is chosen. Members of Phi Theta Kappa chapter Beta Sigma Mu at Tarrant County College helped make a memorable night for nationally recognized transportation professionals as well as raised funds for their organization. On March 21, the chapter posed as paparazzi during National Carriers, Inc. annual Driver of the Year Banquet. The banquet theme recreated the Academy of Motion Picture Arts and Sciences Oscars with the students posing as overzealous paparazzi. 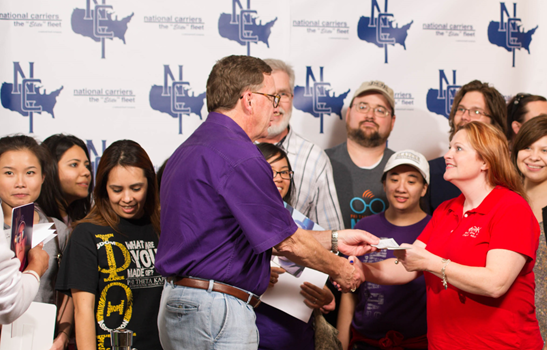 Waving posters of their favorite truck drivers and National Carrier dignitaries, the scholars proved to be an enthusiastic audience as the celebrities entered the Bob Duncan Center in Arlington, Texas. National Carrier supports continuing education through a variety of efforts including classes that promote No Impaired Driving, No Zone Awareness, and the “Elite” fleet® University. Vice President, Loren Bridge, presented a donation to the Beta Sigma Mu members as part of the celebration. Chapter advisor and Tarrant County College Trinity River Campus Speech Instructor, Candace Eldridge organized the students and accepted the donation. Eldridge stated the chapter has created a Campus Community Garden and is re-establishing a campus food pantry. Beta Sigma Mu participates in five community programs each semester and has been recognized as a Top Texas Chapter for the past two years. Only 10 chapters of the eligible 87 receive this honor. The students are in turn donating the proceedings from this fundraiser to help sponsor an upcoming District Spring Fling attended by 20 area chapters.